In her quest for power, Drusilla has unleashed a fearsome foe in the beast known as Camazotz. 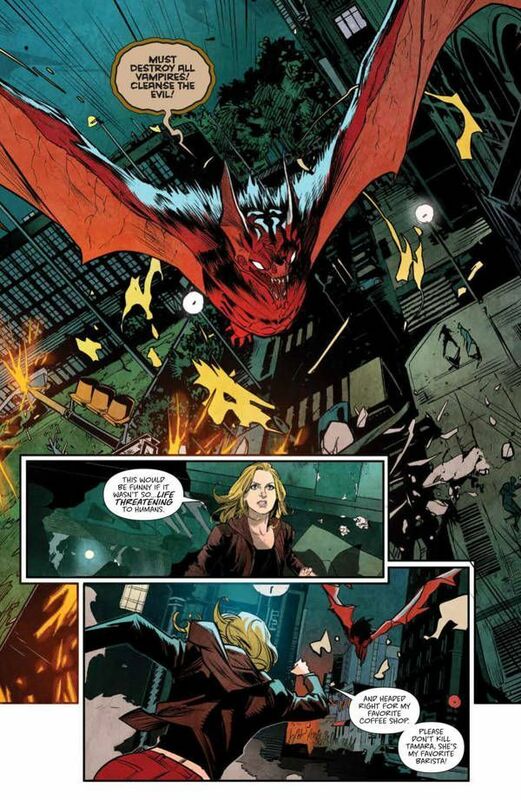 This winged monster descends upon Sunnydale crashing a showdown between Buffy and Spike. Giles, Xander, Willow, and Cordelia lend a hand in what is probably a usual Thursday on the Hellmouth. 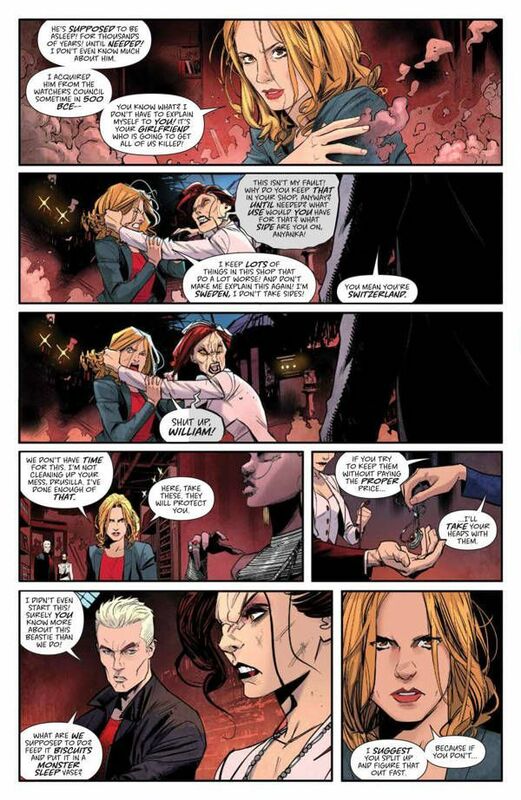 To say that I'm enjoying this new Buffy the Vampire Slayer series from BOOM! Studios is an understatement. Writer Jordie Bellaire is doing some phenomenal work reintroducing us to these classic characters and updating them for a modern age. That doesn't mean they turned in their baggy pants and plaid shirts for whatever young people are wearing today. It's that their personalities and language is brought forward to the present while maintaining their core essence. A great example of this is Cordelia, who jumps right into the fight without a moment's hesitation. When Spike asks her why she's not phased by a giant red bat monster, she turns around with this stunning smile and says “That's right You're not from Sunnydale. It gets a little weird sometimes.” Damn, that is perfect. This is just part of the incredible dialogue at work here. It matches up to the wit and fun we've come to expect from Joss Whedon projects. It also moves at a pretty brisk pace, like an excellent comedy routine. Letterer Ed Dukeshire aids in the delivery of these points with some choice word balloon placement. It's funny to see how this adds some extra humor to a joke, especially when coinciding with a great facial expression. 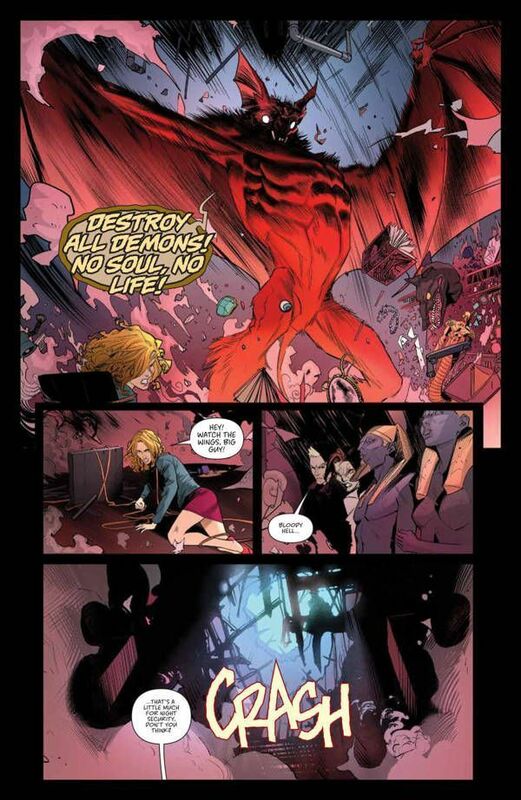 Speaking of which, artist Dan Mora has turned in some magnificent work in Buffy the Vampire Slayer #3. His art just gets better and better. The Scooby Gang alone is pretty great, matching up to the likenesses of the actors that originally brought these characters to life. Where things really take off – no pun intended – is with Camazotz. This is a huge, terrifying bat creature. It takes over every panel it's in with its massive presence. At first it's all carnage and terror, but that changes when it lays eyes on Buffy. Suddenly its whole demeanor changes and it looks like a big, deadly puppy. 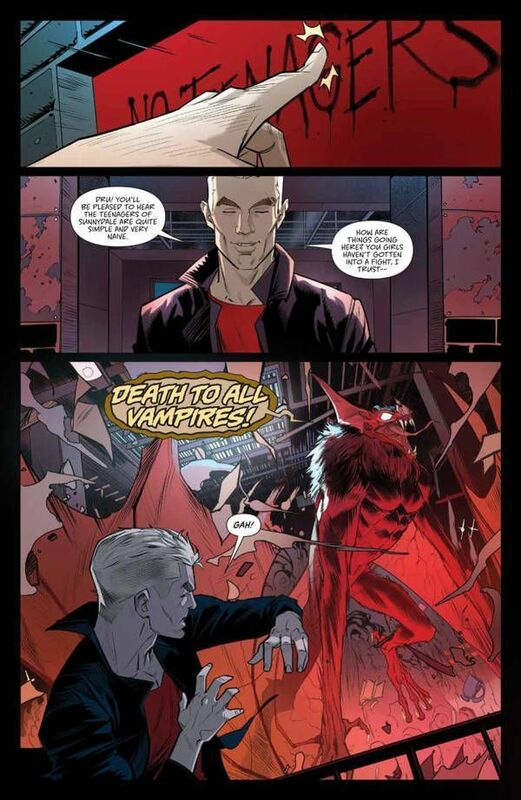 Colorist Raul Angulo adds to the menacing nature of Camazotz with blood red skin and fur. It's interesting that this creature lives to hunt vampires and seems to resemble the thing they hunger for. Although most of this issue takes place during the night, Camazotz isn't covered in shadows. We're able to see him in all his frightening glory. 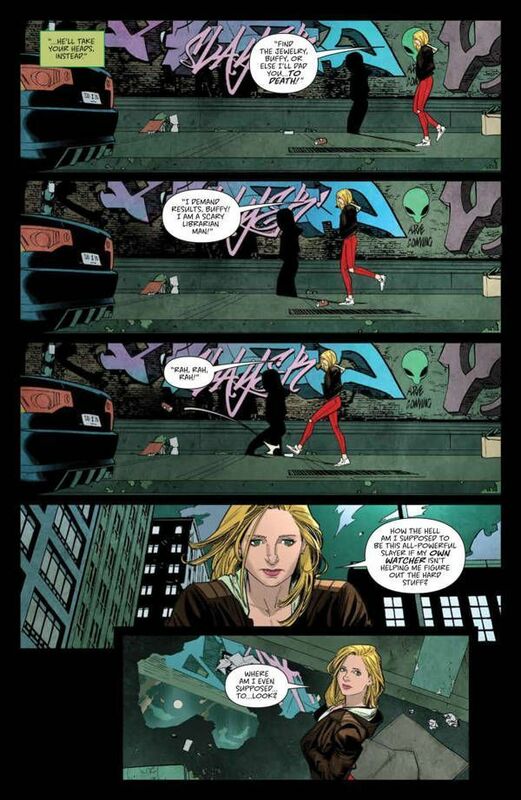 Buffy the Vampire Slayer has been getting better and better with each issue. The creative team is firing on all cylinders, delivering some fantastic work across the board. 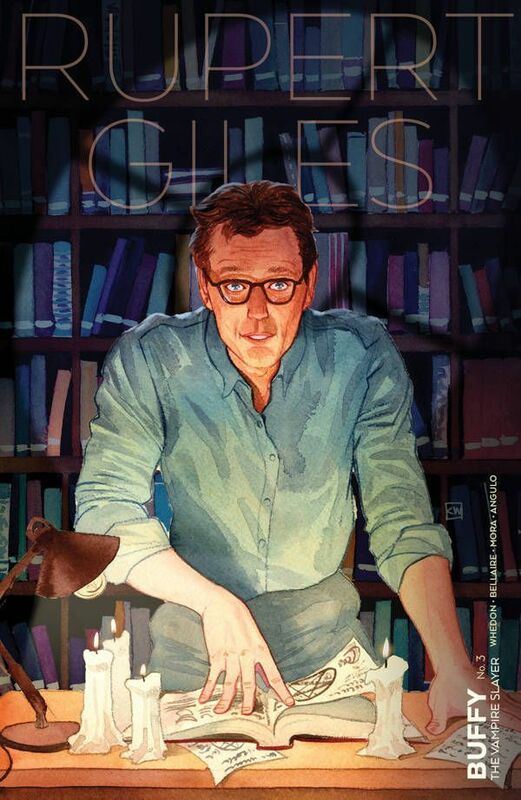 Even if you're only a casual fan of Buffy, you'll find a lot to enjoy about this series. Longtime fans will love this reimagining of the story and all the new elements that have been added in. It's poised to become something big.